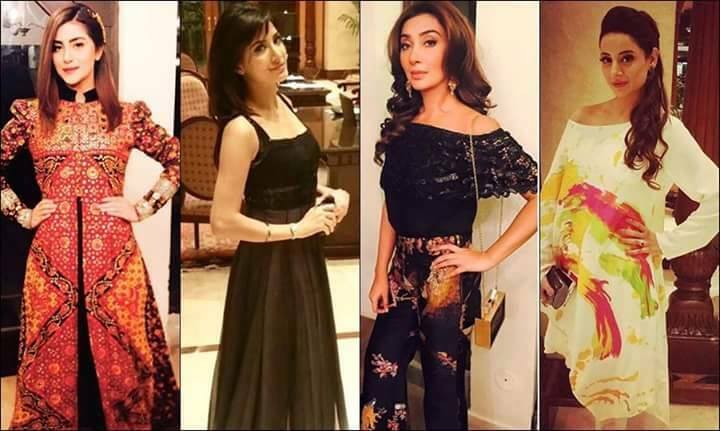 From Lahore to Karachi, and Karachi to Dubai, who wore what? Jawani Phir Nahi Aani – #JPNA – a Pakistani star-studded entertainer produced under the banner of Six Sigma Productions & ARY Films, due to release this Eid-Ul-Azha hosted premieres brimming with glamour in the major cities of Lahore, Karachi and Dubai. The three premieres were attended by all the big names of film fraternity, the highlight being Bollywood director Mahesh Bhatt from the other side of the border, who had come to Lahore to specially attend the premiere and show his support. It’s the revival of Pakistani cinema, and it goes without saying that this revival bolsters the success of our very own fashion houses as well! The cast of Jawani Phir Nahi Aani looked extremely amazing; the costumes were spot on and made to perfection. The cast and especially the female actors looked gorgeous as ever. It is going to be a visual treat to see so many good looking people share the screen. The fashion divas not only look gorgeous in the movie, but they also made a statement at each premiere! Ali Xeeshan’s latest showstopper, Sohai Ali Abro flaunted her ‘Fair and Lovely ka jalwa’ wearing his design and selected another extravagant piece for the first premiere in Lahore. Her second pick was a Feeha Jamsheed green overlapping hourglass dress for the Karachi premiere, and there’s not much we can say but WOW! Our favorite ‘billi’, Mehwish Hayat sizzled on the Lahore red carpet in a beautiful HSY gown and picked a stunning Nomi Ansari dress for Karachi. This woman flaunted gradients on both the events and she sure made them look great! Her final pick for Dubai was Amato Couture and damn did she look gorgeous. 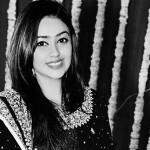 Our very own doe-eyed beauty, Ayesha khan was spotted looking chic in a Shehla Chatoor outfit in Lahore, while she saved the best for the last, making up for disappointing us in Karachi. She graced the Dubai red carpet looking ravishing in a Sana Safinaz outfit, which made us totally forget what she wore before. The sensuous Sarwat Gillani picked Sania Maskatiya for Lahore and an exquisite Shela Chatoor number from her magnum creation for the Dubai premier. 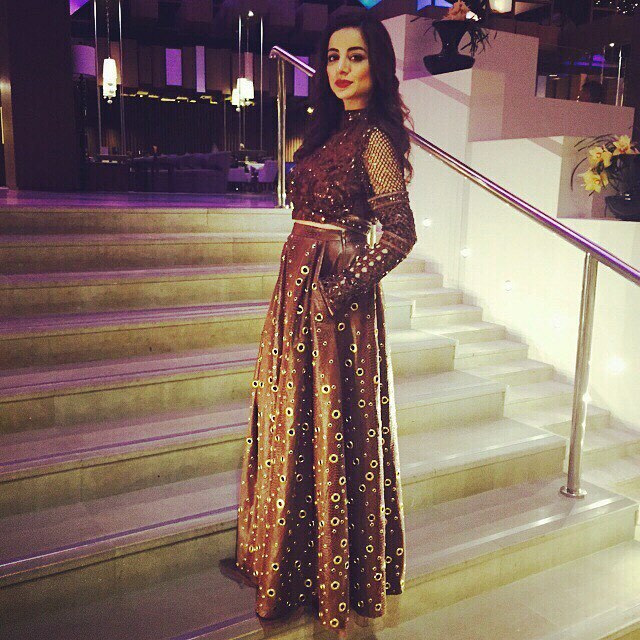 Uzma Khan wore TenaDurani and Cross-stitch, and we absolutely LOVED her look in Dubai!